We’ve been busy the past few days! Here’s a quick update – with photos, of course! On Tuesday, we had an extremely busy day with six meetings throughout the entire day! In the morning, we all met with the Project Director with CRS for the Global Fund Malaria Project. Then we took a trip to the U.S. Embassy to meet with some representatives from USAID. In the afternoon, we split off into two groups to tackle four more meetings CRS had planned for us. One group (Kelly, Mike, and Nancy) visited with two more NGOs (Health Poverty Action and IRC) to talk about their initiatives with TBA integration and healthcare work in SL, while the other group (Lwando, Michelle, and Phil) headed to talk policy with the Ministry of Health Director of Disease Prevention and Control and UNICEF. One of the coolest things my half of the group saw that afternoon was a method of TBA referral tracking being implemented by Health Poverty Action. They were completely pictorial so even illiterate TBAs could potentially get credit for referring women to health clinics. Health Poverty Action created pictorial referral cards for TBAs to send with women when referring them to clinics for various needs during pregnancy. On Wednesday, we turned a hotel room in a war room for about 12 hours while we compiled all of our information and designed the presentation we’d be giving to CRS at 9am Thursday morning. Being in a room with air conditioning, internet, and lunch delivery — ALL DAY — made it feel very similar to a group meeting in Mendoza! 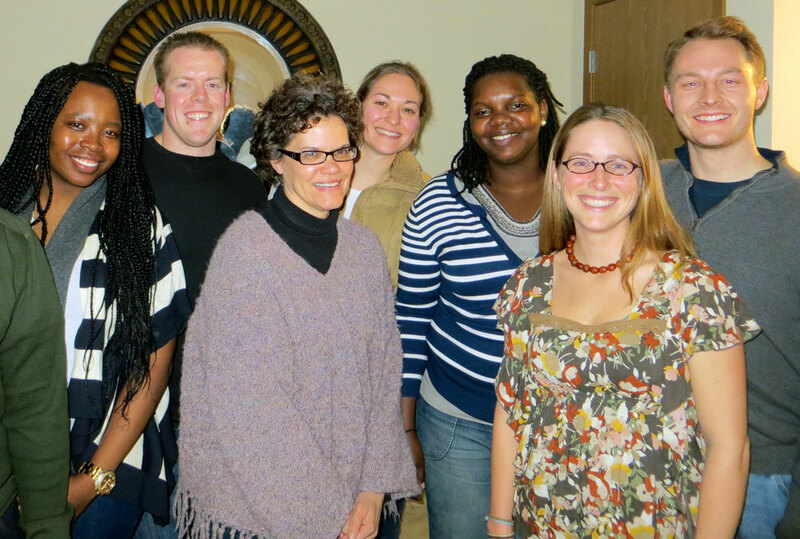 That night, Professor Emily Block arrived in the country and her energy was certainly welcomed after ten long days! We ran our ideas by her before bed, and after a few tweaks, we were ready for the morning. Thursday is a presentation day! (Is everybody happy?!) We had an early-morning run-thru and were able to put the final touches on the “deck” before we presented our findings and next steps to CRS. Of course, we had a couple of slides in there to remind everyone (and ourselves) of the snowy tundra back in northern Indiana. We finished our presentation and, of course, had to take a few group photos to celebrate! Then we were treated to a feast of traditional Sierra Leonean food! Team Sierra Leone is DONE! After a swag exchange, we grabbed a quick photo at the CRS-SL HQ. After our morning at CRS, we were able to finally have some free time in Freetown! We spent the afternoon at Big Market where we all bought some clothes, cloth, and jewelry. Then we were able to make one final visit to St. Mary’s Supermarket — “The Mother of All Supermarkets” — for some celebratory items. We have a day and a half off in Freetown now, so we are going to spend Friday at the Tacugama Chimpanzee Sanctuary, then head down to Laca Beach and stay Friday night. I’m not sure if we’ll have internet there, but hopefully I can get one more post in of us enjoying some time off before we head back to the states on Saturday afternoon. Sadly, Team Sierra Leone was split in half for most of the day today. The “Trio in Bo,” as they were dubbed in the previous, lengthy blog post, visited Mercy Hospital and the Bo District Council Chairman. 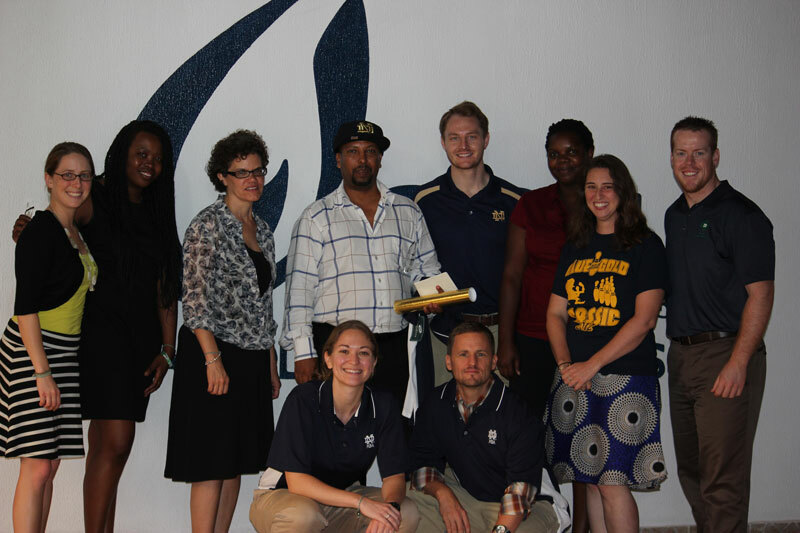 The “Freetown Four” met with three NGOs: Save the Children; BRAC; and Concern Worldwide. Bo is the second largest city in Sierra Leone and is between Kenema and Freetown. Michelle, Mike, and Nancy started the day with a surprise breakfast at their hotel with the CRS Country Director for Sierra Leone! Then they headed out to Mercy Hospital for a meeting with several staff members and a tour of the healthcare facility along with the child rescue center. At Mercy, the Trio chatted with several people about the integration of TBAs into the hospital. Mercy is a privately funded hospital with little to no ties with the Sierra Leone government, so this was an amazing opportunity to understand the challenges and successes of integration from a different perspective. The hospital was a testament to the service that can come with a little money and the right personnel doing good work. Michelle, Mike, and Nancy stopped in Bo for a day to talk with staff at Mercy Hospital. The Trio visited with the Bo District Chairman later in the day and talked numbers — a lot of numbers! The group examined the tax system’s history and present condition including where revenue is spent and how extra funding is obtained. Overall, the team was able to collect a great deal of information about the progress of the tax collection system in Bo and how that might be implemented in other districts around Sierra Leone. Meanwhile, back in Freetown, Lwando, Kelly, Phil, and Susan had a busy day learning about how other major NGOs in Sierra Leone are working with the healthcare issues the entire country is facing. Each NGO had something unique to offer. Save the Children gave us some information about the healthcare in Freetown (a very populous, urban area) that made us think quite a bit about the research from our field work in rural areas. BRAC gave us a good look at their microfinancing programs in the country as well as some upcoming initiatives. Finally, in our second meeting with Concern Worldwide, we learned about their current and future plans for integrating TBAs into the formal healthcare system. 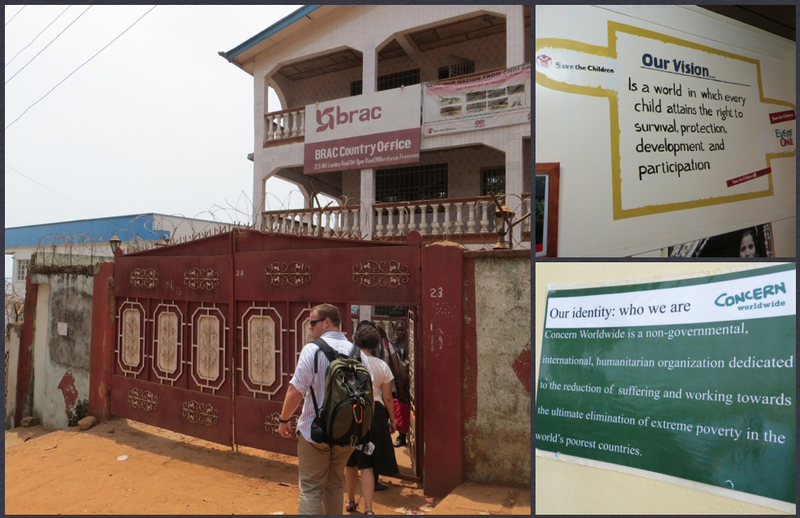 Team Sierra Leone visited Save the Children, BRAC, and Concern Worldwide. At the end of the day, we were all able to join up and go out to dinner on the beach at a great restaurant called “Roy After 12 Bar.” The food was delicious, and they deliver! It was mostly just great for us to all be together again. Even though we were only apart for a little over 24 hours, we actually missed each other quite a bit! Thanks for reading! ‘Til tomorrow! Sierra Leone: We’re Back on the Grid! The last time we touched base was on Tuesday night, when we travelled to Kenema (in the east) from Freetown (capital city on the west coast). I’ll start recapping with Wednesday morning. We started our day in Kenema bright and early. The electricity (air conditioning included) at our hotel was only running (by generator) from 7pm to 7am, so waking up early is quite easy when the a/c goes out in the muggy conditions (it’s consistently been 85 degrees (F) at about 80% humidity). 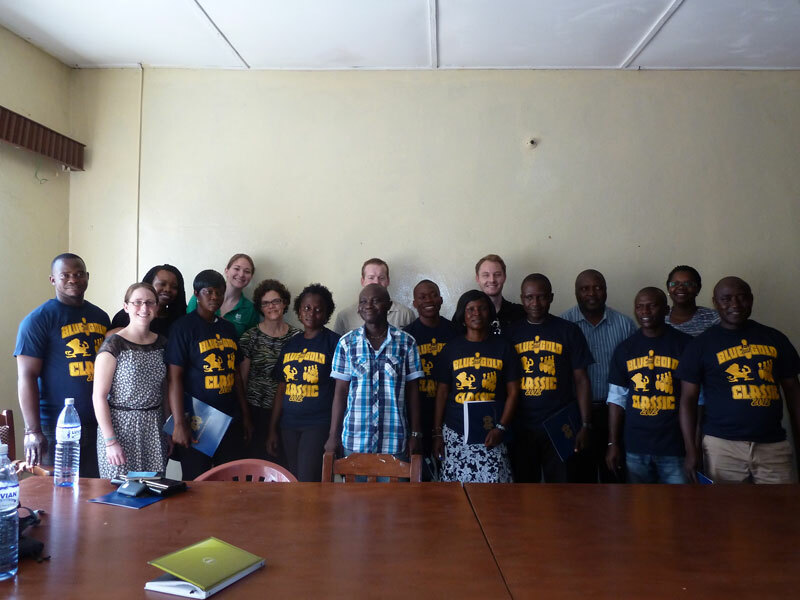 We met the CRS staff at the CRS office in Kenema to touch base, then kicked off our research. 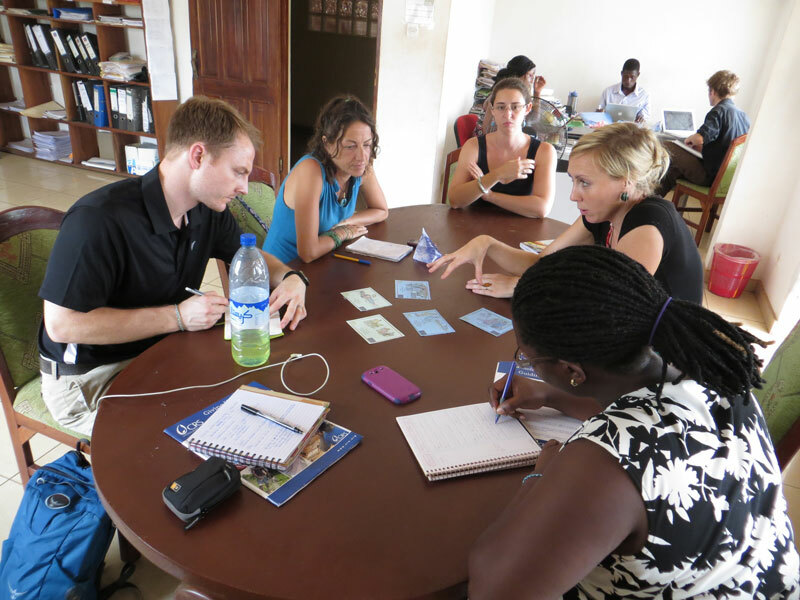 Fortunately for us, there happened to be a monthly meeting that day with a CRS team that have been working in the field on a program in conjunction with Concern Worldwide (Gates Foundation) called Quality Circles. In short, this program has been working on the integration of TBAs (Traditional Birth Attendants) with the formal healthcare system taking into consideration the training of facilitators and phasing out dependence on NGOs. We interviewed eight field workers (CRS staff that have been overseeing meetings and training facilitators), the QC manager, a representative from Statistics Sierra Leone, and a representative from Concern Worldwide. They were so kind, open and honest, giving us a lot to reflect on as we loaded up to take a bumpy three-hour ride to Kailahun, the main city in the district of Kailahun and the location of the district government and secondary healthcare (hospitals, training facilities, etc). Team Sierra Leone with Quality Circles staff in Kenema. Okay, bumpy may have not been the correct term… jarring may be better… especially for the final 20 miles on the washed out dirt roads. It made us realize, first hand, the struggles the infrastructure gives to people from remote villages seeking advanced medical attention in Kailahun. When we got to our hotel, we had a meeting with the coordinator for a nutrition program called Mothers to Mothers named Yousef. He talked to us about his experiences with the integration of TBAs in the formal health system based on his first-hand experiences and interactions with women in the program. One of the most interesting insights from Yousef was his stress on involving fathers in maternal and child healthcare; men serve a major decision-making role when women decide to seek formal healthcare in Sierra Leone. Team Sierra Leone meeting with Yousef at our hotel. It wasn’t all work though! We were able to go to dinner together, share some stories, have a few laughs, and have a great debrief that night. After we had a good night’s sleep, we were off to the Kailahun District government offices to meet with a group of district-level government health care representatives. We had introductions, then we split into two groups to discuss specific healthcare issues with the venerable District Health Officer, Dr. Bome (he was amazing! ), along with health committee members from various villages, and financial officers. That afternoon, we had am impromptu trip to the Kailahun district hospital. There, we met with more than twenty staff members including the (only) doctor, head nurse, financial officers, and attendants from the different hospital wards.The highlight of this trip was getting to meet a retired (but not tired!) midwife that came back to work at the hospital. When asked about some bookkeeping information at the hospital, she pulled out a worn notebook with all of the birth records from the month. We were floored. This woman has been a midwife since 1985. Despite being retired, she still delivers babies at the Kailahun hospital. 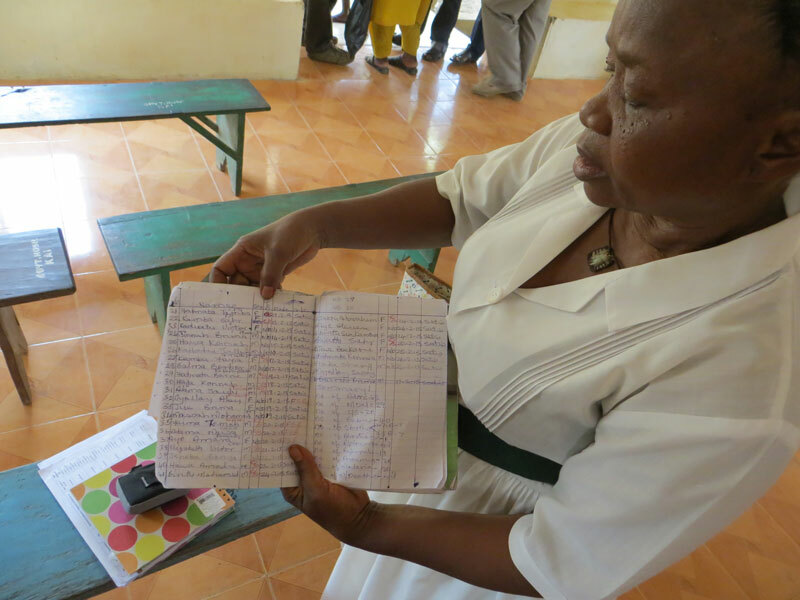 In the photo, she is showing us her birth ledger for the month of February. This was an incredibly memorable day for much of the team. We split into three groups, each going to a different health center in and around Kailahun. One group (Mike, Susan, and Kelly) went to a village called Gbalahun where they caught an International Women’s Day parade and interviewed a group of TBAs, community members, and the health center staff. 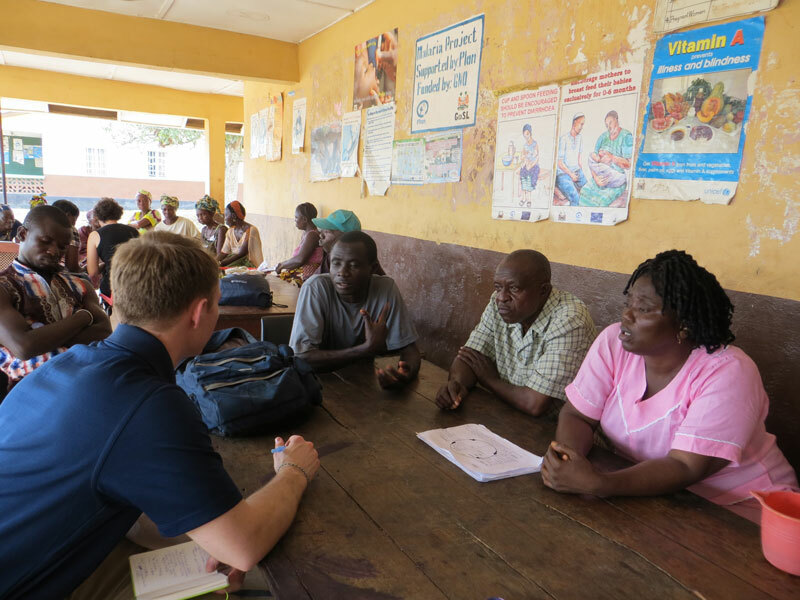 Team Gbalahun interviewing healthcare staff (foreground) and TBAs (background). The second group (Lwando and Michelle) went to Mofindor and talked to the TBAs working with that clinic along with some other community stakeholders. 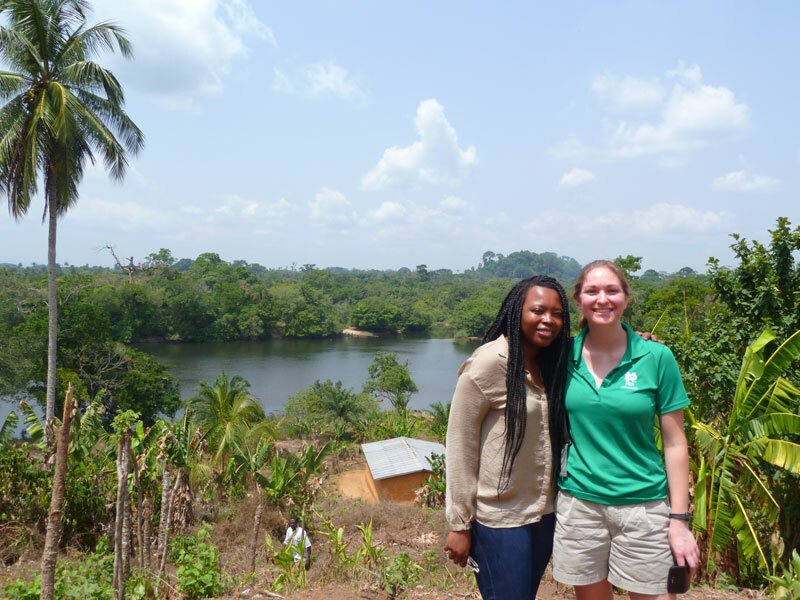 On top of going on a nature walk to the nearest drinking water source – a 17 minute walk – with some community members, they were also able to get a photo at the Guinea-Sierra Leone border! Lwando and Michelle checking out the border between Guinea and Sierra Leone. Finally, the third group (Nancy and Phil) stayed in Kailahun to talk with health center staff there and follow-up on some financial information with the Financial Officer for the district. We woke up earlier, and hotter, than we preferred. Despite our air conditioners going out in the middle of the night, we were able to get a good start making the trip back to what we now consider “the big city of Kenema.” We thought it would just be a driving day, but we happened to drive near a BEMOC (Basic Emergency Medical & Obstetric Care) Center and meet the CHO (Community Health Officer, the guy that runs the center). On top of being extremely impressed with his knowledge on running the clinic, we were really impacted by his personal commitment to sustaining the clinic, many times out of his own pocket. 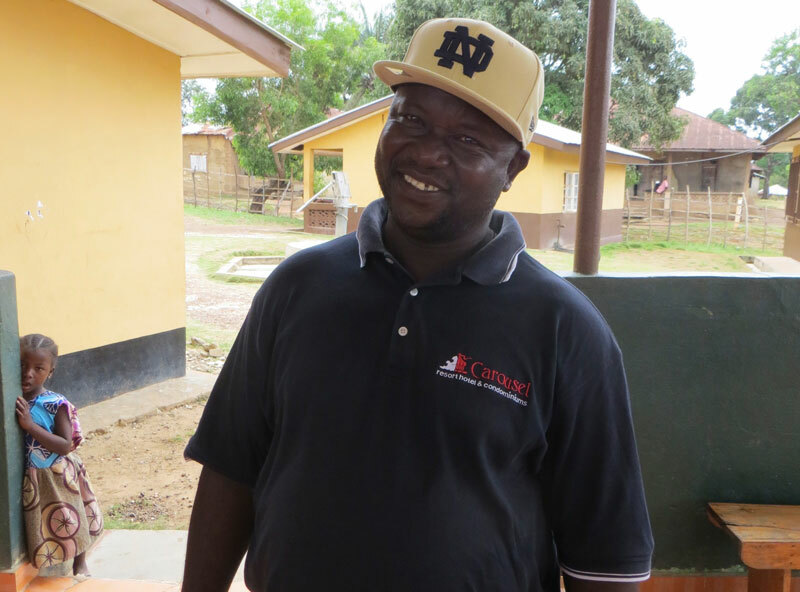 Community Health Officer at a BEMOC Center between Kailahun and Kenema. 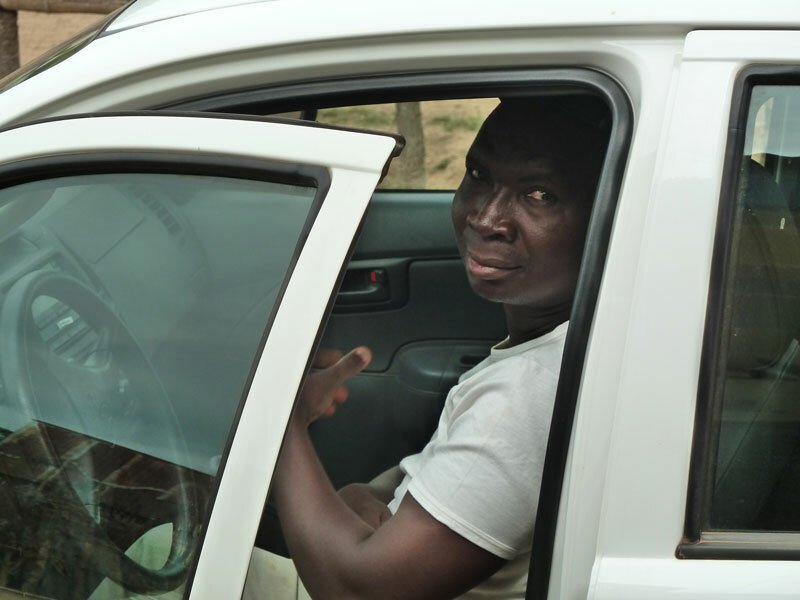 When we asked him why he uses his own money to finance the clinic he responded, “Because these are my people. I care about my people and my country.” This commitment to social responsibility seems to be a theme among Sierra Leoneans. It’s humbling and inspiring. Today, we left Kenema but not before heading out to 8am mass where a few members of the team were able to meet with the bishop and enjoy some great music! 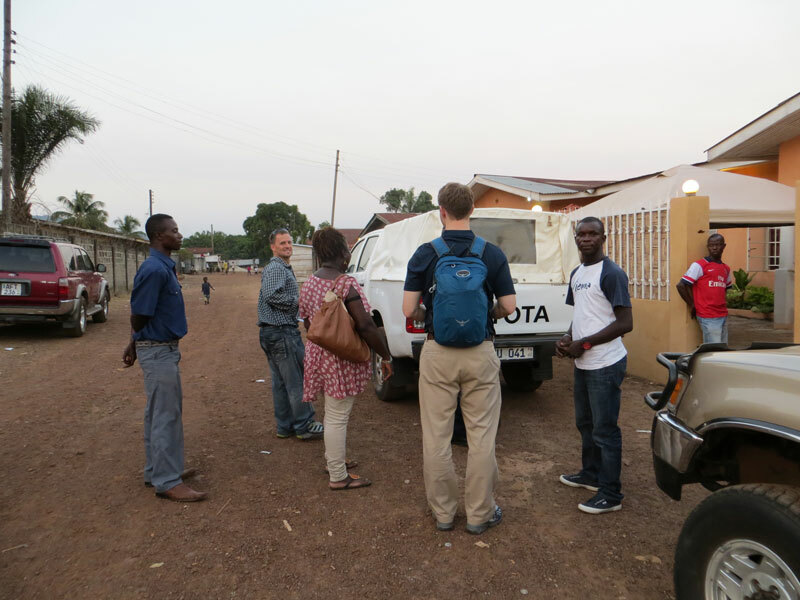 Half of the team (Mike, Michelle, and Nancy) is making a stop in Bo to visit with some stakeholders there – government and NGO – while the remainder of the team (Lwando, Phil, Kelly, and Susan) kept going to Freetown. While it was a low-key travel day for the “Freetown Four,” the “Trio in Bo” had a busy day of meetings. We’ll all meet up again Monday evening to plan out the remainder of the week! Since this is practically a novel anyway, I might as well add a couple of quick acknowledgements here. 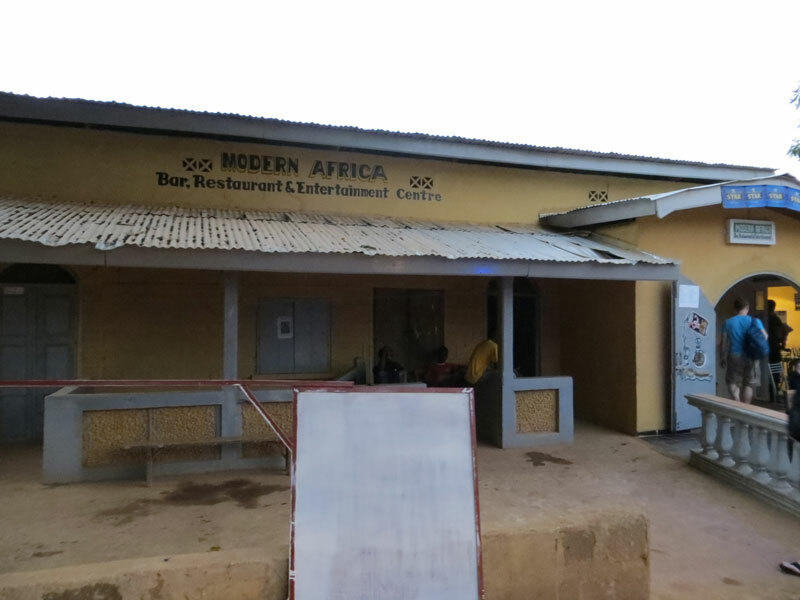 We’d like to thank Modern Africa, a true Kailahun experience, for feeding and putting up with us night after night. Despite having very limited dining choices in the town, we really did like the place! Also, a huge thanks to our unofficially official photographer (and driver), Shangbe. He’s always shown up at the right place at the right time with his camera snapping photos of the group and our surroundings. We love you, man! Shangbe. One of the amazing drivers, and super sneaky photographer, with CRS. We were able to get some good rest last night (Monday night) so we were ready to go this morning! We had a delicious breakfast (and not Nescafé coffee, much to our delight!) 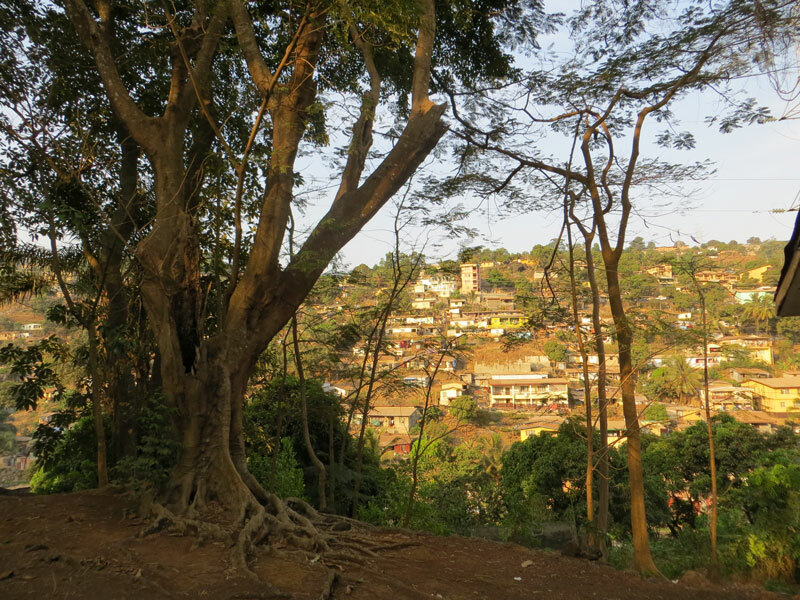 with a beautiful view of a hillside in Freetown. Sometimes photos just can’t do a view justice, but nevertheless, here is our view from breakfast. After breakfast, we loaded up our stuff and drove – yes, drove – 20 meters (that’s ~60ft) to the CRS headquarters in Freetown. It was easily the shortest trip we’ll be making in these two weeks! 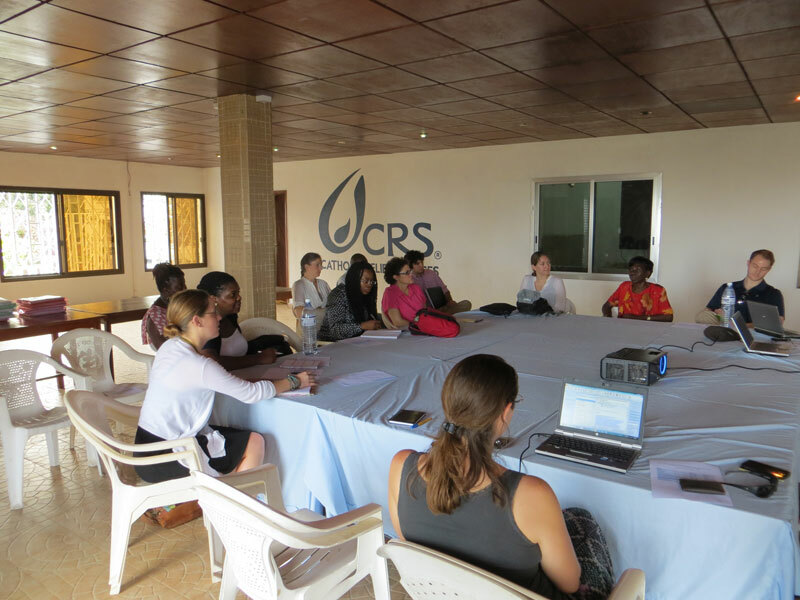 At the CRS HQ, we met with the CRS – Sierra Leone staff members to learn about the current projects CRS is operating in Sierra Leone, along with a overview of our project and a short Q&A. 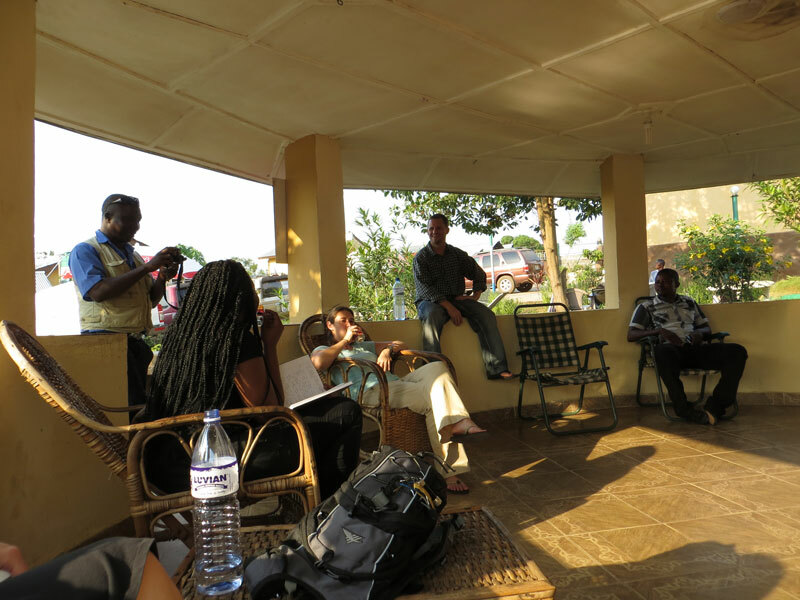 Team Sierra Leone meeting with the CRS staff in Freetown. CRS was also kind enough to have money exchanged for us! 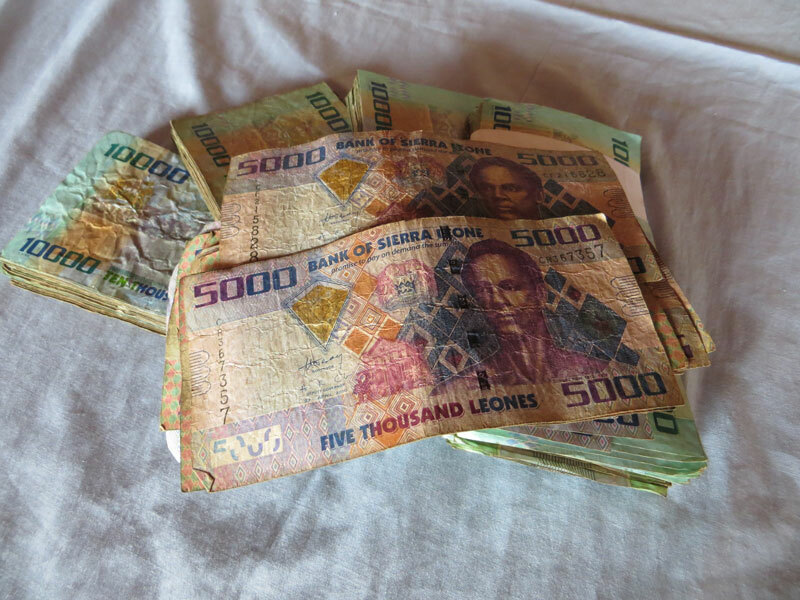 The exchange rate for Leones and USD is about L4300 to $1, so this looks like a LOT more money than it actually is! Once we finished at CRS, we stopped at a great grocery store (called St. Mary’s!) where we grabbed a quick lunch (falafel, shawarma, and fried chicken sandwiches – there is a huge Lebanese influence in Sierra Leone), drinks, and snacks for the road. Then we were off to the city of Kenema in southeast Sierra Leone. After a little more than 6 hours (on nicely paved roads, mind you) we made it to our destination! As always, we’re so thankful to be a part of this assignment. The people in Sierra Leone have been so kind and welcoming and we’re looking forward to learning more over the next couple of weeks. 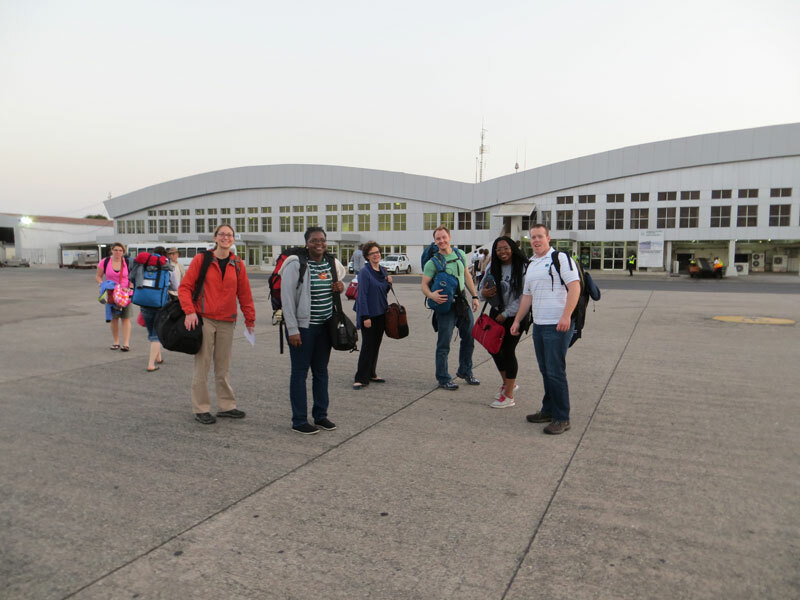 We had a long 28-hour trip from South Bend to Chicago to Brussels to Dakar, and finally to Freetown, but we made it! It’s definitely hot and humid compared to South Bend right now, but we won’t have much time to think (or talk) about the weather. We’re meeting with CRS-Sierra Leone staff in the morning, then heading straight out to Kenema — a 5-hour drive — for the rest of the day! Team Sierra Leone is heading out over the Atlantic to Sierra Leone on Sunday! 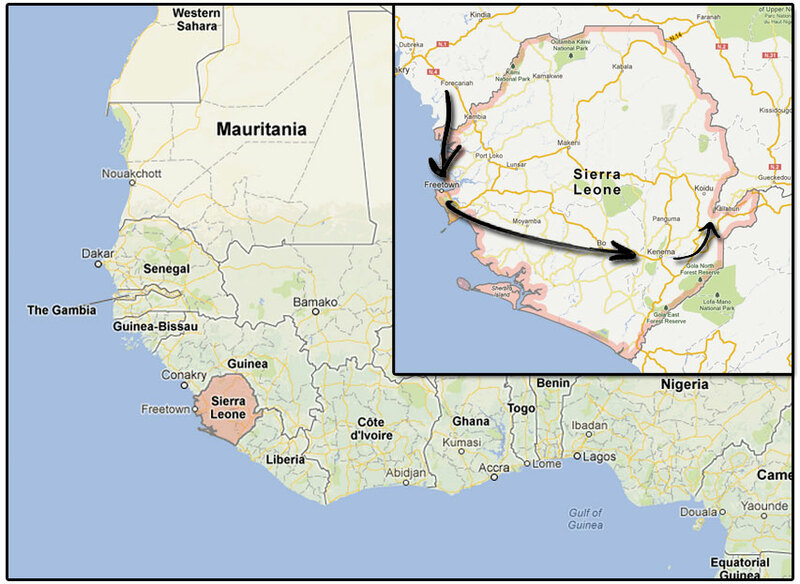 Sierra Leone is located in northwest Africa between Guinea and Liberia. 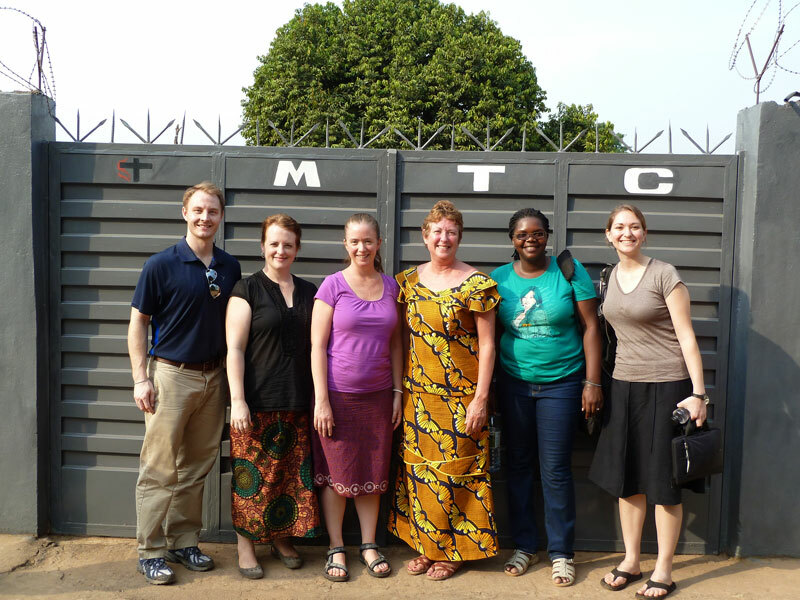 The whole team of six (plus our faculty sponsor, Susan StVille), will begin in Freetown, Sierra Leone’s capital, and then head east to Kenema and Kailahun for five days to interview health staff and other stakeholders in maternal and child health. Then half of the group is going to stay east for a couple of days to do some site visits in Bo while the rest of the group will head back to Freetown to talk with the Sierra Leone government and NGOs. At that time, Professor Emily Block will be joining up with us too! This is Business on the Front Lines’ first project in Sierra Leone and also the first time the course is working with healthcare. 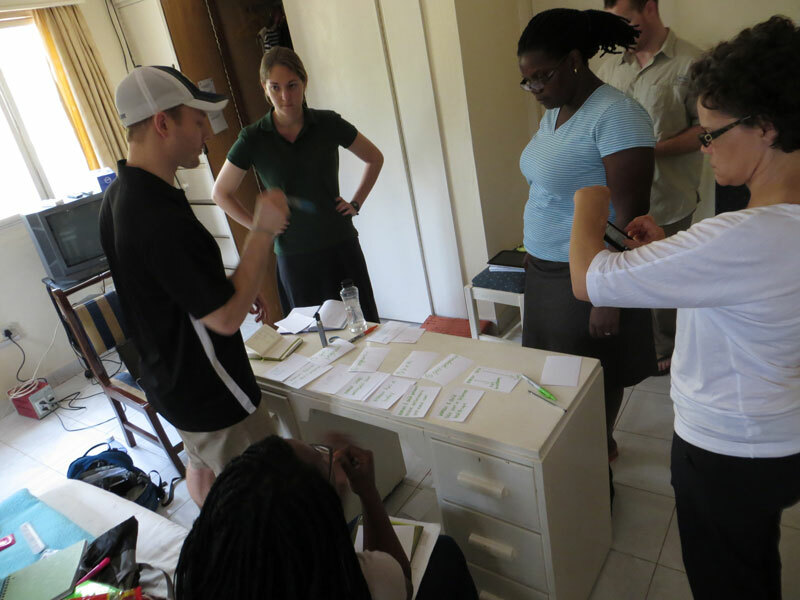 Our team will be working with Catholic Relief Services (CRS) to find a way to merge the traditionally-trained birth attendants (TBAs) with the formal healthcare system in order to reduce maternal and infant mortality rates. One possible solution would be to have TBAs become community health workers (CHWs), which are aligned with the government healthcare system, but the problems here are two-fold: CHWs are unpaid volunteers; and becoming a CHW means that there will be many more responsibilities in addition to assisting with births. Our job, in this case, involves creating an incentive strategy for TBAs to become CHWs – what needs to be done in order for TBAs to move to this formal healthcare role so they can provide more comprehensive services and assist pregnant women, new mothers, and their young children with proper medical care? Fortunately, there has been significant support for maternal and child healthcare from the Sierra Leone government in the past few years. The Free Healthcare Initiative (FHC-I) was enacted in April 2010 which provides all pregnant and lactating women and children under 5 years old free healthcare. 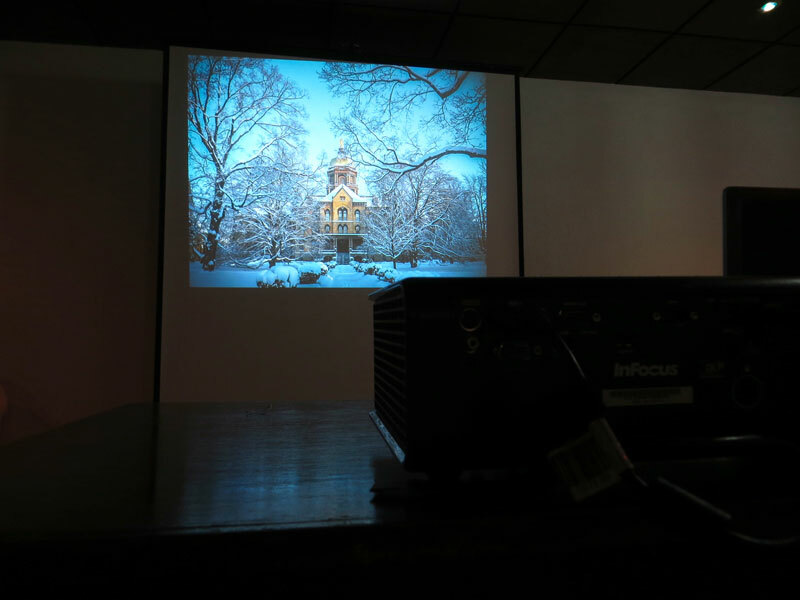 The sustainability of this program is in question, though, as it is largely funded by donors. The encroaching 2015 deadline of the Millennium Development Goals is another concern, as Sierra Leone tries to address MDGs #4 and #5 in reducing maternal and infant mortality rates. (Sierra Leone currently has the third highest rates in the world.) The new Minister of Health and Sanitation, Miatta Kargbo, provides a ray of hope in her initiatives to solve some of the core problems with the high mortality rates such as curable complications, teenage pregnancy, and women’s rights. CRS has been in Sierra Leone since 1963 and has supported Sierra Leone throughout its brutal civil war (1991-2002) and on the post-conflict stage. In regards to maternal and child health and our project in particular, CRS has a program called Quality Circles that acts as a means for open dialogue and counseling between TBAs and the formal healthcare system. We are going to be fortunate enough to be able to speak with CRS employees and TBAs that are members of Quality Circles during our time in-country. Outside of work, we are going to have some free time in Kenema and are hoping to explore the beautiful beaches around Freetown. We are also going to visit to the Tacugama chimpanzee sanctuary! We are all honored to be a part of this class and project. We hope to put our best foot forward to serve alongside CRS in making Sierra Leone a better place for women and children to live healthier, happier lives. After graduation, I’m heading to: Not a clue – hopefully on vacation! Previous experience: Doing civic education with highschool students- if you want to see a shift- work with young people. Its important for them to know what defines the society they live in whether its socially, legally or politically- you have to get them interested. Fun fact: I moonlight as a party planner. In 5 words or less, “Why BOTFL?”: Because every class blows my mind. In 5 words or less, “Why BOTFL?”: To serve the world through business. Fun fact: I play the drums! In 5 words or less, “Why BOTFL?”: Learning, travelling, and serving. Together. Previous experience: Worked with women who have been subjected to violence to access health services including reproductive health. Fun fact: I love dancing! In 5 words or less, “Why BOTFL?”: The challenge & opportunity that comes with it! Fun fact: I got to hang out with a lot of rock stars while I was working for a drumstick manufacturer! And I also play the drums! In 5 words or less, “Why BOTFL?”: More than just another class. Previous experience: Coordinated and facilitated job readiness training for the homeless in the DC area through a corporate partnership between Accenture and a non-profit organization called Back On My Feet. In 5 words or less, “Why BOTFL?”: Learning and growing through service.